The following pictures shows material returned. 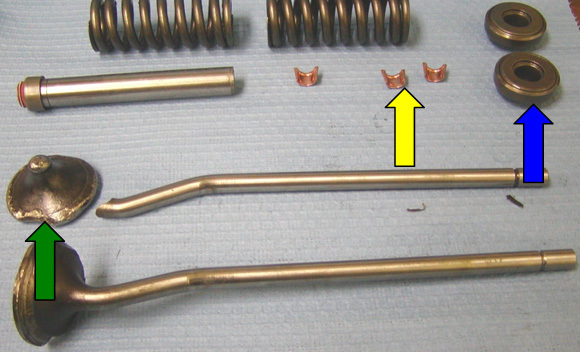 The yellow arrow pointing at the valve retainers show they are undamaged. The rotators indicated by the blue arrow were inspected and function properly showing no damage. The two valves in the foreground show no galling in the stem indicating they did not seize in the valve guide. The Green arrow points to the broken valve, note location of break. In the above picture the green arrow points to the valve head and the area the valve broke. This is the strongest part of a valve. This type of failure only occurs from impact. The second valve is bent in the same location but did not break. All the possible causes such as valve sticking in guide, broken valve retainers show no signs of failure as seen in the first picture. Conclusion: Since both valves are bent in a similar manner, the piston hit the valves and not some random piece of foreign material. The root cause of failure is impact loading.